Christopher Heath and V. Shane at Heathen Oracle are reading for a dark swords & sorcery anthology called Artifacts and Relics: Extreme Sorcery. They are taking the interesting approach of only contacting authors they are going to publish and not sending rejections, as well as announcing acceptances their Facebook page and blog. A modern approach to old tymie fiction. Heathen Oracle pays a bit higher than standard rates for indie press. 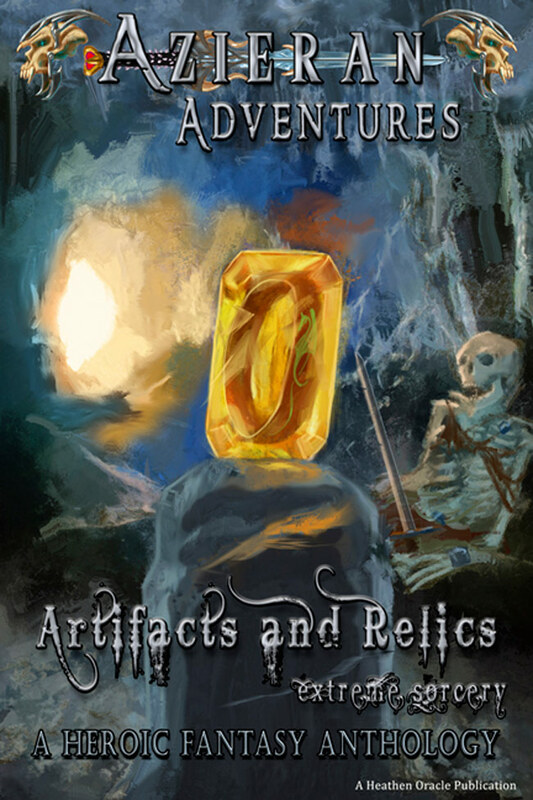 Heathen Oracle is now accepting stories for its Azieran Adventures anthology, “Artifacts and Relics: Extreme Sorcery” until June 30th. Heathen Oracle will be paying $50 per story, $25 per reprint. Payments will be made within 1 month of publication. For accepted, previously unpublished stories, rights include exclusive publishing rights in all forms for 6 months from release date, afterwards author is free to have story reprinted elsewhere, but Heathen Oracle retains the right to publish the anthology and story in perpetuity in all forms. For reprints, all rights to the story for purposes of reprinting must be retained by the author for publication at Heathen Oracle, during which time the story must not appear in any new publications for the period of 6 months, after which time the author is free to have the story reprinted elsewhere—but Heathen Oracle retains the right to publish the anthology and story in perpetuity in all forms. This will allow us to keep the anthology intact and available to customers. We are paying an upfront fee, rather than paying royalties, as we are a creative operation and have no desire to become accountants, calculating and doling out small sums every period. The anthology will be published as an ebook, with other media options as a future possibility. Use Standard MS, and format of PDF, .doc, or .rtf. PDFs may be reviewed first due to editor’s preference. Please send submissions to: aandrsubs@gmail.com. Place your story title in the subject line. Include a cover letter in the email if you like. Simultaneous submissions are readily accepted–as a freelance writer, until a contract is signed, it is your right to pursue alternate ventures for your work. Multiple submissions are not accepted. In an effort to efficiently allocate time, personal replies for rejections will not be sent; there will be an announcement whenever a story is accepted on both the Heathen Oracle website blog, and the Heathen Oracle Facebook page (please join, scroll down on homepage of this website to do so or use the link below). The accepted author will receive notification as well. There will be an announcement whenever the anthology is filled and closed, though we won’t be accepting any more submissions after June 30th at the latest. If we decline to use your story, it should be understood that we will unfortunately likely be declining many, many stories we’d love to accept, however, it is simply not possible to publish all the stories we enjoy. There will be an editing period, with the author consulted on any and all changes. We are looking for heroic fantasy submissions (in the vein of sword and sorcery, sword and planet, dark fantasy, and high fantasy) of up to 10,000 words (query if over 10,000 but I’m very open to the idea of anything up to 20,000 words). The work should prominently feature a powerful artifact or relic, and include strong characterization, a well developed plot, interesting setting, and a satisfying conclusion. Writers who hit upon all of these points will have a greater chance of acceptance. The story should be set on a secondary fantasy world and include original characters/settings and not infringe upon the copyrights of others (therefore fan fiction is not accepted). Content should be no worse than an R rated movie. It may be worth noting that the editor is a fan of the following authors’ works from the old (and not so old) guard: Robert E. Howard, H.P. Lovecraft, Fritz Leiber, Michael Moorcock, Karl Edward Wagner, David C. Smith. This should give some indication of the styles and types of stories that would be a good fit for this anthology. Also, each submission should begin with an introduction of several paragraphs describing the nature and brief history of the artifact or relic. The story may directly relate to this description/historical account, but does not have to—as long as the artifact or relic plays a significant role in the story. If your story is accepted, before contracts are sent and signed, you will be asked for your written permission via email to allow us to use this introduction to promote the anthology, your story, and yourself as an author prior to release of the anthology, to generate public interest in the anthology. If your story is a reprint, as an introduction, simply write a few paragraphs detailing and providing a history for the artifact or relic involved in the story.